Manchester Piccadilly Railway Station, M60 7RA. 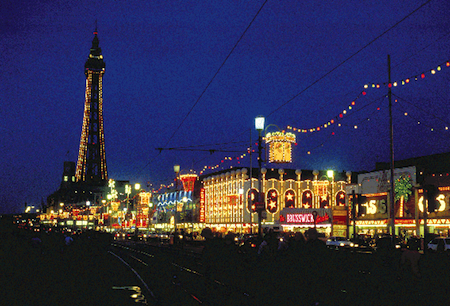 The Blackpool Illuminations consist of almost every kind of light display you can imagine: lasers, neon, light bulbs, fibre optics, searchlights and floodlighting. In 2012 there were more than 500 scenic designs and features. There are set pieces made out of wood studded with light bulbs: the characters and objects portrayed seem to “move” by way of winking lights. Three-dimensional illuminated scenes are also popular. There are over 500 road features attached to lamp posts linked together with festoon lighting. Strings of lights along the structure of buildings pick out landmarks in luminous detail – you can always make out the Tower and the Pleasure Beach rides in this way. Some of the hotels on the east side of the Promenade are floodlit in colour sequence. Even the trams on which you can tour the lights are illuminated and decorated with specific themes. We will be catching the 12:16 train from Manchester Piccadilly. The cost of a day return ticket at time of writing is £16.80. What is the plan for the return, are we coming back Saturday, or staying over? Stephen Sutherland : Coming back in same day.